NextGen Gaming is an online casino provider and Australian subsidiary of the prestigious NYX Gaming Group. Together they offer fast, flexible gaming systems and premium gaming content to a huge range of partners. NextGen has fast earned a name for itself as the world’s leading independent supplier of innovative games for the gambling industry. Their parent company, NYX Gaming is highly reputable within the casino industry and has partnerships with a majority of leading online operators around the world, with customers thrilled by the dependable delivery and platform options for online gaming on both desktop and mobile. NextGen and NYX Gaming services are offered to online and land based casinos, for real money wagering as well as free entertainment gaming. NYX and NextGen boast a library of over 300 games, including casino, lottery and bingo platforms which can be played for free and real money in Australian currency. Head to G’day Casino (link) or Guts Casino (link) to have a look through some of the impressive titles on offer, like these popular titles below. 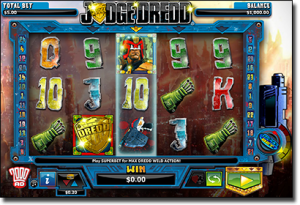 Judge Dredd – one of the newest and most exciting additions to the NextGen catalogue, this game brings the famous comic book hero to life in an action packed pokies bonanza. If you loved the movie then you’ll love the game. Minimum bet is 1c with a maximum bet of $2.00. Pizza Prize – best not played on an empty stomach, Pizza Prize is a deliciously fun online pokies game utilising an Italian restaurant theme, complete with sweet accordion music that you’d expect to hear on the streets of Rome. Its clean simplicity maintains the impressive graphics and player options that makes NextGen’s repertoire of games so notable. Minimum bet is 1c with a maximum bet of $2.00. Wild West – NextGen calls this one a “rootin’ tootin card slingin’ galoot” which pretty much sums it up perfectly. Full of awesome animation and kitschy western themes, this game is for those who like their gaming light-hearted and downright fun. Minimum bet of 1c with a maximum bet of $2.00 per spin. Dragon Drop – another new pokies favourite, Dragon Drop takes an almost Shrek-like fairy tale theme, full of quirky characters and lively tunes. Minimum bet of 1c with a maximum bet of $2.00 per spin. 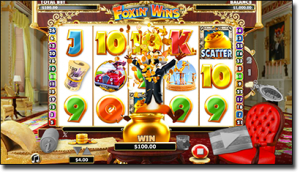 Foxin’ Wins – a great example of the NextGen clarity of animation, Foxin’ Wins is a traditional pokies game with cute critter images and cheerful music that makes for a fun, lively player experience. This game offers some great bonus rounds, including the fabulous leprechaun shakedown. There is a minimum bet of 1c with a maximum of $2. Hugely popular, there is now a second game in this series, Foxin’ Wins Again which is fast proving to be more popular than its namesake. Easy Slider – this spin off of the classic 60’s film Easy Rider is one’s for the bad-asses out there, featuring an original rock themed soundtrack and tough motorcycle sound effects. This pokies game provides a range of player options including a movable slider at the top of the reels which players can use to vary their multipliers and wilds. Minimum bet is 1c with a maximum bet of $2.00. Where can Australians play NextGen and NYX games online? Being an Australian company, it’s fabulous to see NextGen receive such high praise all over the world, taking centre stage in the online casino industry. Their games can be enjoyed from a range of sites for free and real money, but why waste time searching online for one you can trust. NextGen and NYX support the MOVE mobile network, so their games are flawlessly optimised for mobile access. Understanding the importance of multi-channel gaming, games are available on a range of platforms, including mobile, desktop and through various social media channels. Running from offices in Sydney, NextGen has set the standard for online casino gaming in the Australian market. Its mission for success is pretty simple: maintain the balance between innovation and the ‘proven fundamentals’ in order to create games that keep players coming back time and time again. Above all, the company’s main focus is to create ultimate player entertainment while providing businesses with exceptional online games that will continue to attract customers and revenue. By balancing creativity with structure, NextGen is continuously coming up with fresh and exciting ways to enhance the player experience, resulting in some of the leading games on the market. Fully supported, by their highly successful partner company, NYX Gaming, NextGen follows the business ethos of creating memorable player experiences. NYX aims to “attract, entertain and retain,” a company vision that has secured it a place as a leader in the industry. NYX Gaming Group was crowned eGR’s RNG Casino Supplier of the Year 2013 award, backed up by a Special Achievement award in 2014’s eGR B2B Awards, testament to its dedication to providing reliable, engaging systems and content. NYX takes its innovation far beyond just creating incredible games, by providing gaming system solutions used by top industry professionals like World Lottery Association members, media companies and private and publicly listed gaming companies. Its range of turn-key casino products for social channels boosts online casino traffic while also giving land-based casinos higher exposure to draw punters through their doors. We’re talking about a highly advanced company at the forefront of technology, providing the most efficient way to access hundreds of games for web and mobile.